Today's giveaway is from sweet Chelsea of A Lovely Little Shop, for this peacock ore necklace, "Eyes Are Mosaics." 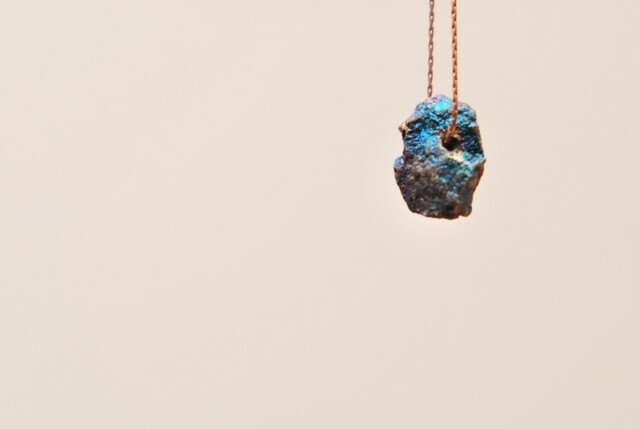 Chelsea makes stunning, cosmic jewelry, influenced by a childhood growing up in a rural area in which her nearest neighbour was three miles away. She would spend her time outdoors with her brothers and sister, digging through streams for quartz and pyrite, climbing trees, and building forts. It sounds like a perfect childhood, and today she works with peacock ore to remind her of her mineral collections. I chose this piece for the giveaway because it reminded me of one of my favourite paintings by Carly, Bornite. To enter, please visit Chelsea's shop, and leave a comment telling me which one of her pieces is your favourite. I love Lateral Noise myself! This giveaway is open to everyone. I will select a winner at random on Friday -- good luck! I love the show me the season! My favorite this week is Golden Vein....I'm also loving the new photography in her shop. I love Garlands! Although Eyes are Mosaics might be my favourite. it's so hard to choose! i'm torn between the show me the season & the eyes are mosaics. i really like the colours in lateral noise but there's something about a beautiful and unique mineral that's hard to resist so i have to say that the eyes are mosaics necklaces are my fave! My favorite is the Show Me the Season necklace. so fun! i actually found her shop through your blog a while back, and i fell in love with golden vein, and this necklace that's being offered! ooohhhh i hope i win! Beautiful shop! I love the Kidnapper bell! I love all the peacock ore and the show me the season necklace keeps catching my eye. truly lovely little shop! eyes are mosaics necklace is beautiful! beautiful things! i love the simplicity of circling girl... and the peacock ore is magic. i think golden vein is my favorite.... though all are really stunning! Beautiful jewelery! Glad to know about this shop! I love all of her work, but Empryean Glow is quite nice! Lovely, makes me think of a precious meteor that someone finds that has magical properties. I really like the winter wonderland best. such a cute shop she has. love the golden vein. this ring is very pretty. i love the materials she uses, great colors! I like the one you've shown here best. Peacock or for the win! I love all of the eyes are mosaics necklaces. thanks for the chance to win! Oh I really love glacial peacock ore ring! The necklaces as well, it's all about those amazing stones. Gorgeous photos and pieces! My face is the double strands of the Golden Vein necklace. Love them all. I have one that I wear EVERY day! Chelsea is amazing! oh i think it has to be eyes are mosaics! Easily the eyes are mosaics necklace! wow. really hard to choose. but i think i'd have to go with lateral noise. or maybe garlands.. oh i don't know! thanks for introducing me to this shop! Shores of Orion is lovely, but so is Golden Vein, along with everything else! This is gorgeous... what stunning colors! I'm swooning over 'show me the season' -- love the simplicity! I love "show me the season," so delicate and pretty! I have to say, I love the Eyes are Mosaics series. That purplish one that looks like a star is so sweet. Oh my, her jewelry is beautiful! My favorite is the one you chose--eyes are mosaics. Love the colors! Ohhh, pretty! The Kidnapper Bell is my favourite. I think I have to buy it! I love "show me the season" very sublime! I think my favorite is the one you posted, actually. I love the rock necklaces. 'This cat is a landmine' wins for me with best name but the 'eyes are mosaics' are just gorgeous, all those different colors...sigh. my favourite is golden-vein! beautiful! thanks for the chance to win! kendallkt at hotmail dot com. I like this one, Eyes Are Mosaics. I collect magical rocks and this one is filled to the brim! this one is so beauitful! I think actually that the "Eyes Are Mosaics" one is my favorite--I love all the different colors in the rock, it would be just the thing for a grey winter's day. Ohh the Circling Girl necklace! It's so simple and pretty. it is a lovely shop! i like the lateral pieces such as "cat is a landmine". I love the one you have featured here the most. SO pretty! I love "this cat is a landmine," for the name and the double strand. The peacock ore necklace is pretty dreamy, thanks for hosting another wonderful giveaway! Ooh the Glacial Peacock Ore rings are loverly. i really like the simplicity of the darkfall necklace. eyes are mosaics = total fave! thanks for the giveaway! what a great little shop and beautiful necklace - it is definitely my fav! I'm pretty into this Eyes Are Mosaics one pictured here. I like that your choice for this giveaway was influenced by a painting :) Both the necklace and the painting are beautiful. I also hadn't heard about the material 'peacock ore' before so I looked some stuff up and this is what I found; "Peacock ore can be used to break up energy blockages and can open up and cleanse the Crown Chakra. It makes an excellent meditation stone." Interesting! I definitely could use some of that around my neck. My favourite item in her shop is the glacial peacock ore ring in shades of green. Mesmerizing! I love them all but I think my two favorites are the kidnapper bell and three sisters! The cat is a landmine! i love how simple everything is, and yet it's such a bold statement. i am more drawn to the mosaic items though, those colors are beautiful! I've had Chelsea's fire flies and empty skies in my Etsy shopping cart for ages! She has such lovely necklaces. Wow- so pretty. I love the golden -vein piece. But. it is really hard to choose! It's really hard to choose. Everything is beautiful. Remaining Light is gorgeous. Oooo... Fingers crossed!!! My favorite is fire flies and empty skies! I love the eyes are mosaics necklaces. They remind me of my childhood rock-collecting! My favorite is "this cat is a land mine"! I love the name and the vibrant blue! gold star mothers is beautiful, as is everything else in the shop! I love the "eyes are mosaics" necklace the best! Especially love the texture! this one is my favorite, actually. so beautiful! i'd go for the eyes are mosaics necklace or golden-vein necklace! Tough choice! Love the peacock ore pieces, but Show Me the Season is so simple and sweet. I love this one - it's already layered and will work well with layering others with it! Versatile too, you can dress it up or down. Thank you! I have been eyeing off eyes are mosaics for a while now! I do like through a glass darkly and golden-vein as well. I can't go past eyes are mosaics in blue peacock, but those prints are great arent they? The eyes are mosaics necklaces are perfect! I love all of the Eyes are Mosaic necklaces and the golden vein necklace. What a pretty shop! I love them all! So hard to choose. But I think my favourite is Gold Star Mothers. Oh, and her photography is really good too! oh goodness, what a necklace. I can't get enough. 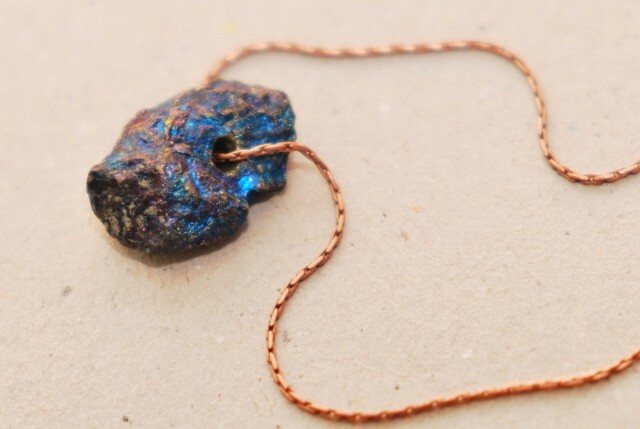 I love so many of those peacock ore necklaces, but I have fallen hard for the goldenvein and remaining light necklaces. They're great! My favourite are the eyes are mosaics necklaces. They are beautiful and strong looking on the dainty chains. The rocks remind me of the ones I saw at the museum of Nature in Ottawa when I would go as a little girl. My favorites are the Eyes are Mosaics ones, especially in blue! Fantastic! oh gosh. these are beautiful! "eyes are mosaics" are definitely my favorite. so good! eyes are mosaics for sure! :) It's so unusual, I love it! I love "eyes are mosaics"!!! such beautiful colors! it reminds me of growing up in Massachusetts and thinking if I broke open rocks I would find treasures inside:) also, being an illustrator I can't help but become obsessed with little treasures like this. p.s. love your blog! I quite like the 'shores of orion' one! three sisters necklace! i'm a sucker for the name, it reminds me of my two sisters and i. and i love the blue stones. The necklace you are giving away is absolutely stunning. And I have to say that it really is my favorite one in the shop! "Eyes are mosaics" is such a thought provoking name for it too. I love the three sisters necklace (among other things!). Thanks for this great giveaway!!! This giveaway is BRILLIANT. I'll be dreaming of the "glacial" (peacock ore ring in various shades of blue OOAK). I blogged about the shop just recently. It's nearly to delightful for words! So hip hip hurray to Chelsea and to you for this lovely little chance. Wee! What a great giveaway, and what a great shop. I definitely love the eyes are mosiacs pieces the most! simplicity and great colour. i love the one being given away most! The lateral noise - limited edition is amazing, what an awesome shop! show me the season is my favourite, though garlands is a very close second! I like eyes are mosaics most. I love the glacial ring, but it's so hard to choose. "this cat is a landmine" wins best name for sure. I love all of the eyes are mosaics necklaces. they also reminded me immediately of carly waito's paintings! My My My!!! What have you done! You have opened my eyes up to another beautiful etsy store! Every piece is beautiful but I cant get enough of the eyes are mosaics necklace in the gorgeous Fuschia type colour its stunning! Count me in for this beautiful giveaway! My favorite is the glacial (peacock ore ring in various shades of blue OOAK). It's so lovely! What a wonderful giveaway. I'm crazy about 'show me the season'. it's so delicate and lovely. ah, fantastic timing! I've seriously been admiring her work from afar. My favourite is lateral noise too. golden-vein and the eyes are mosaics. very nice. I love the peacock color and can't get past it! this necklace is my favorite from the store. Breathtaking. I love the names. I am torn between garland and glacial. Both are so lovely! Thanks for the giveaway! I like the "gold star mothers" necklace best. Oh my goodness, I love the "glacial" ring! I love this cat is a landmine. Although, there's no question the pieces are all beautiful, I wish there were some photos with the necklaces on a person. all of this jewelry is amazing! 'gold star mothers is beautiful', but i'm also in love with 'all eyes are mosaics', and i think i need the 'glacial' ring to go with it. I adore the glacial ring, as well as the giveaway piece! This shop has all the things that I love. I love it all, and I love that it has a mix of jewellery and photography! Gimme gimme I love this. the eyes are mosaics necklace is absolutely stunning! Well... I can see it's hard, since there are so many participants, but I'll try my luck anyway - it's worth it! All of her jewelry are lovely! My favorite has to be the gold star mothers! I love the golden-vein necklace -so lovely. I love the "circling girl" necklace and all the names of the jewels! I love 'Show Me the Season' and 'Gold Star Mothers'! so many pretty things in one place! i really love the show me the season necklace. i love chelsea and her work. i'd be so honored to wear another piece of hers. besides the one you're giving away, i love "show me the season," "empryean glow," "dark rift," and "fire flies and empty skies." so many good ones! I love gold star mothers - the color of the blue is amazing! I'm with Caitlin - Gold Star Mothers is my favourite! I'd also be thrilled to win this one, as I had a memorable chunk of peacock ore in my childhood rock collection, for which I've been pining lately. I'm very much hoping to find it in my grandparents' attic when I return there in January. Thanks for the lovely giveaway, Anabela! Yes! My favorite is This Cat is a Landmine. Pretty, pretty. I love the two tiered look of "shores of orion", but they are all beautiful! Ooh you picked the best one! And the best runner-up too. Weird, almost like we have SIMILAR TASTES! I love the peacock ore ring. Her items are pretty and very reasonably priced. I'm thinking I might get some good xmas presents here! winter wonderland - OOAK !! My favorite is that peacock ore-- it's lovely, and so is the photo of the playhouse door. Oooh, what an amazing shop! I love love love the garlands necklace! Thanks for the chance to win! xoxo. i love the winter wonderland necklace! definitely the golden-wein necklace! too perfect!! I like lateral noise too. It's simple and a lovely color. My favorite one of her pieces is empyrean glow the contradicting shapes on the simple gold strand is beautiful. Also it is an ideal length for me. Ooh, hard to choose... but I think "Shore or Orion" is my favorite one! I'm glad you featured this shop, I'm now a fan! I used to collect rocks as a child. This peacock ore reminds me of that, so it's my favorite! I'm drawn to the delicacy of Winter Wonderland, as well as it's uniqueness of being one of a kind. Plus, the name evokes such a seasonal feeling that it would be hard not to refer to frosty memories when wearing it! The Flock of Soul necklace caught my eye, and it has a lovely name. The Glacial peacock ore ring is also very cool! I love Eyes Are Mosiac. I love cosmology and that little rock really gives me that feel. I love it! And thank you for supplying this giveaway! Loving the Parallel Highway! Pyramids and triangles are always intriguing, and it has a GREAT name!